If you wanted to add an automatic watch to your Hamilton collection - that would present a challenging dilemma. There are 59 automatic models in the initial K-series line alone. There are 66 models in the Accumatic line as well. That's 125 different models in just those two lines and there are probably another dozen specialized automatics like the Rotomatic and Asthmatics lines too. Of course, you can't forget the 57 Thin-o-matics that are available as well. That means there are about 200 models to choose from. Collecting vintage watches is not a hobby for prudent people. Or should I say, a prudent person probably wouldn't be drawn to collecting watches... just one would probably do fine. However, if someone was, say, married to a prudent person and could could only sneak one or two watches into the house every now and then, then my advice would be to focus on solid gold models. Why is that? Simply put, the maintenance costs of a solid gold model are the same as a gold filled model. So if you're going to have a "prudent" collection, you can minimize your maintenance costs by focusing on solid gold models. Focusing on solid gold models also makes your decision much easier - as that removes over 2/3rds of the choices from the pool. One of the great choices would be a 1957 Automatic K-203. It was produced through 1961. 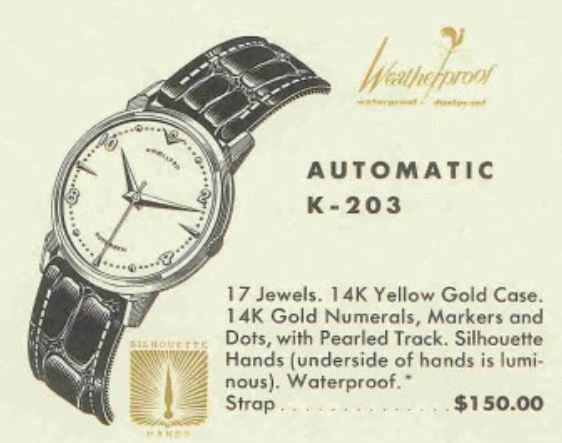 Being a 200-series watch, you'd be correct to expect the K-203 to come in a solid 14K yellow gold case. It has a silver dial offers solid 14K numerals and markers along with a pearled track. The K-203 also has silhouette hands - meaning there was radium applied to the bottom of the solid dauphine hands so that they glowed onto the dial from under the hands. I'm sure that was a very interesting effect when the watch was new - but by now the radium on the hands can take it's toll on the dial's finish. Like most K-series models, the K-203 has a 17 jewel Hamilton 661 movement safely tucked inside. I recently picked up a very nice K-203 project watch. It came on a period correct bracelet but I don't know if it's an original bracelet. The catalogs don't mention a bracelet being available - so maybe it was installed at the original purchaser's request. The solid gold case back in engraved with a presentation from 1960 for 35 years of service. There are no marks whatsoever to indicate that this watch has ever been opened. It took all of my strength to open the case back. There are no marks on the inside of the case back either - so I suspect I am the first person to see the inside of this watch since the first person to close it up in 1960. The movement is bright and shiny - but surely after 50+ years it's about time this watch got some fresh oil inside. There's not much radium lume on the hands - which is probably why the dial looks as good as it does. I remove the rest of it in the cleaner while the other parts are being cleaned. There are a LOT of parts in a 661 movement. It's not the easiest movement to put back together but if you're careful, it's not the worst movement either. The reassembled movement is running again and goes onto the timer. Without the oscillating weight and the carrier, the movement looks like your garden variety manual winding movement. The oscillating weight (rotor) connects to a carrier that is fastened to the back of the movement. I put the rotor on last, before closing up the watch, as it's swinging around makes the movement a little awkward to handle. With the watch running great, the dial and hands go back on and it all goes back into the case. A new crystal will complete the watch's restoration and a watch this nice look like new. The expansion bracelet fits the watch very nicely and it also fits my wrist - so I may leave them joined like I found them... although I tend to prefer a strap over a bracelet. This K-203 turned out magnificent. My camera is ruthless for pointing out flaws and this watch is flaw-free. There's a hint of radium burn to the center of the dial but you wouldn't notice it in person. If you could only have one automatic in your "prudent collection", this watch would be a great choice. After wearing it for a little while, I found the bracelet seemed to compete with the watch so I installed a genuine gator strap instead... now there is nothing to distract from this watch's beauty.